Some years ago, or to be more precise, early in 2010, I read Oura Sôgorô´s (小浦宗五郎) article on a hira-zukuri wakizashi blade of Kaga Ietsugu (加賀家次) – probably by the Kôji-era (弘治, 1555-1558) Ietsugu – which bears a very interesting kinzôgan-mei (pictures 1 and 2). This kinzôgan-mei reads „Toya-ire – Masashige + kaô“ (鳥屋入・政重). Toya-ire, also called „toya-gomori“ (鳥屋籠) or „toya-bumi“ (鳥屋踏) are special bird houses similar to chicken coops (the toya, 鳥屋) where the hawks retreat towards the end of summer to moult. 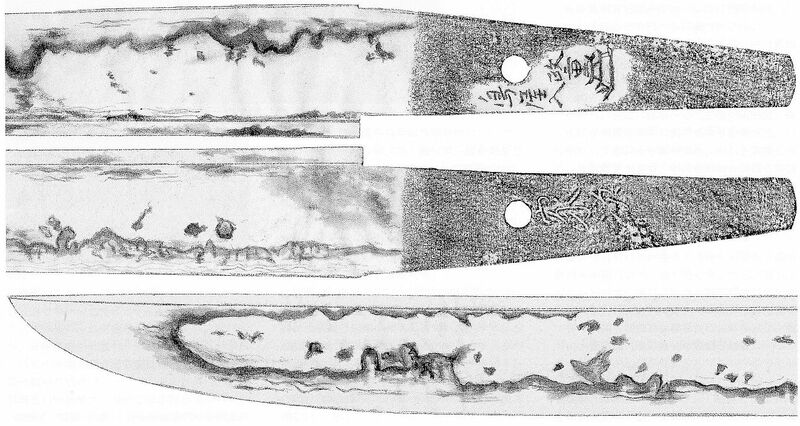 The inlayed name „Masashige“ refers to Honda Masashige (本多政重, 1580-1647) and can be confirmed by comparison to another blade from his possessions, namely the Kanemitsu katana (兼光) with the kinzôgan-mei „Honda Awa no Kami shoji kore – Masashige + kaô“ (本多安房守所持之・政重, lit. „from the possession of Honda Awa no Kami Masashige“). And with this blade (it can be seen at the bottom of this link), we are right at why this article was of special interest for me. The Kanemitsu is an important heirloom of the Honda family and preserved in the Hanrô Honda Zôhinkan (藩老本多蔵品館), a small but very fine museum in Kanazawa, Ishikawa Prefecture. Over a couple of years, I spent some months in that area and visited the museum a few times, admiring the highly interesting objects. At my very last visit, I met there the present-day head of the Honda family, Honda Masamitsu (本多政光), and after a quick chat in the course of which I told him from my special interest in swords, he invited me to come back when his schedule allows to see the Kanemitsu hands on. How sad it was that I was leaving Japan at that time! But let´s get back to the topic. The question is, why has Honda Masashige „moulting hut“ inlayed in gold on one of his blades? The aforementioned Oura does not provide a definite answer but a very comprehensive approach. For this approach, we have to go further and take a closer look at Honda Masashige´s life. Masashige was born in the eight year of Tenshô (天正, 1580) as second son of Honda Masanobu (本多正信, 1538-1616) who was a retainer of Tokugawa Ieyasu and who held at that time the Tamanawa fief (玉縄藩) in Sagami province with an annual income of 10.000 koku. When Masashige was twelve years old, he was adopted by another Tokugawa-retainer, namely by Kurahashi Chô´emon (倉橋長右衛門). With this adoption, he got the name „Kurahashi Chôgorô“ (倉橋長五郎). Two years later, at the age of 14, he also entered the services of the Tokugawa family. 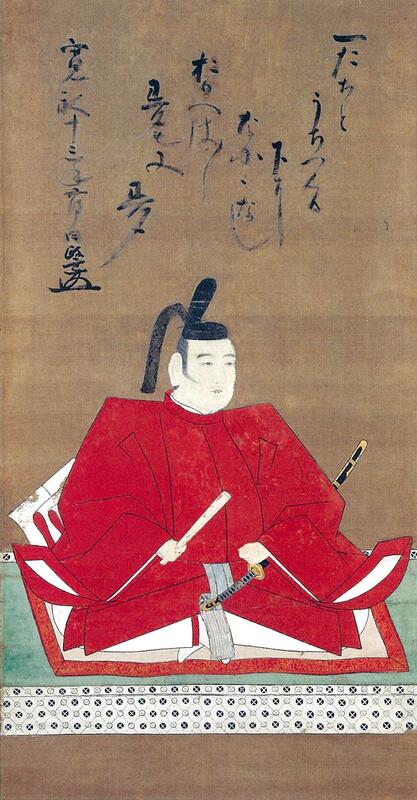 Some say he served Ieyasu but extant documents show that his employer and lord was actually Ieyasu´s son Tokugawa Hidetada (徳川秀忠, 1579-1632). Well, in Keichô two (慶長, 1597) – he was (according to the Japanese way of counting years) 18 years old – he killed in a quarrel Okabe Shôhachi (岡部庄八), the son of Hidetada´s nurse Ôuba no Tsubone (大姥局, 1525-1613). Thereupon he fled Edo in the very same night and hid in Yamada (山田) in Ise province for about half a year. During that flight he had his genpuku ceremony and bore henceforth the name „Masaki Sahyôe“ (正木左兵衛). But in Keichô four (1599) he was able to become a retainer of the Toyotomi-retainer Ôtani Yoshitsugu (大谷吉継, 1558-1600). In the same year he was in turn employed by another Toyotomi-retainer, namely by Ukita Hideie (宇喜多秀家, 1572-1655), who granted him lands with an income of 20.000 koku. So he fought eventually at the side of Hideie against the his old lords the Tokugawa at Sekigahara. However, he was back then still treated as son of the faithful Tokugawa-retainer Honda Masanobu and was therefore able to get off scot-free. After a short service under Fukushima Masanori (福島正則, 1561-1624), he entered the service of Maeda Toshinaga (前田利長, 1562-1614) and moved to Kaga with an income of 30.000 koku. Picture 3: Portrait of Honda Masashige whereat the poem is written by himself. This painting is also preserved in the Hanrô Honda Zôhinkan. The kaô is similar to the kinzôga-kaô but as the latter is an inlay on a sword tang, it is of coure not 100% identical with the handwritten one. Only one year later, i.e. in Keichô nine (1604), Masashige – back then still under the name „Masaki Sahyôe“ – married Omatsu (於松), the daughter of Naoe Kanetsugu (直江兼続, 1560-1619) and was thereupon adopted by the latter and took the name „Naoe Katsuyoshi“ (直江勝吉). He received the character for „Katsu“ from Kanetsugu´s lord Uesugi Kagekatsu (上杉景勝, 1556-1623) who had already planned that Omatsus son should become his heir. But when shortly later, i.e. in the fifth month of Keichô nine his own son Sadakatsu (上杉定勝, 1604-1645) was born, Omatsu´s and Masashige´s or rather Katsuyoshi´s future son was right out of the question. As a result, he returned to his original family name and was called since that time „Honda Masashige“. And some years later and by recommendation of his Ise acquaintance Tôdô Takatora (藤堂高虎, 1556-1630), he again returned in Keichô 16 (1611) – some sources say it was in Keichô 17 (1612) – into the service of the Maeda, namely of Toshinaga´s half-brother and adopted heir Toshitsune (前田利常, 1594-1658). One of Masashige´s greatest accomplishments for his repeated lords the Maeda was his negotiation with the bakufu when there was a dispute on who should receive the Niikawa district (新川郡) of the neighbouring Etchû province worth 190.000 koku, i.e. either Tokugawa Hidetada or Maeda Toshitsune. Hidetada feared that the already wealthy Kaga fief gets too powerful. But with the support of his father Masanobu and his older brother Masazumi (本多正純, 1565-1637), Masashige was able to decide this in favour of the Maeda which offered him an increase of his salary by 50.000 koku. 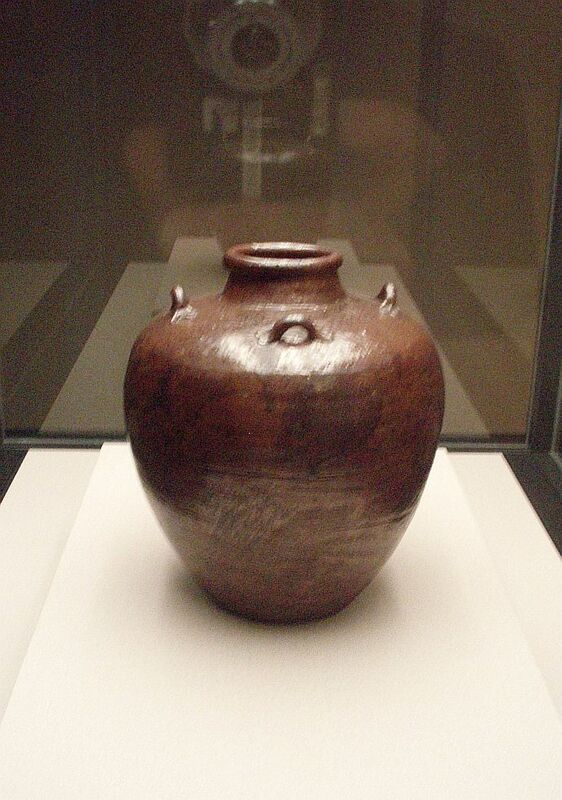 This would have earned him the incredible income of 100.000 koku but he refused according to transmission and took instead a personal gift, a famous and precious Momoyama-period jar called „Murasame no tsubo“ (村雨の壷) which came from the possessions of Hideyoshi. Because of this decline of the 50.000 koku salary increase, the jar got the nickname „Gomankoku no tsubo“ (五万石の壷, „the 50.000 koku jar“, picture 4). Picture 4: The Murasame no tsubo (preserved in the Hanrô Honda Zôhinkan). Please apologize the blurry picture and the reflection of my camera. On now we come once again back to the kinzôgan inscription in question. Oura namely found an incident recorded in the „Honda Awa no Kami Masashige shoseki-basshô“ (本多安房守政重事蹟抜抄) which reports from a meeting with Maeda Toshitsune. The latter had already retired (his year of retirement was Kan´ei 16 [寛永, 1639]) and invited Masashige once summer to his tea house in Komatsu (小松) which is about 25 km to the southwest of Kanazawa. There, Masashige saw a furosaki-byôbu (風呂先屏風) – a special smaller screen used in tea rooms – which showed paintings of the famous master Kanô Tan´yû (狩野探幽, 1602-1674). The motif were flocks of wild geese (karigane), wild ducks and mandarin ducks flying across the tips of pines. According to the aforementioned record, Masashige was deeply moved and liked the screen a lot and the servants asked why he had such a special interest in this item. Masashige responded that he has to reply in the form of an old poem which goes: „Karigane no koshiji no michi no tôkereba, hane o yasumen to Yonejima no matsu“ (雁が音の越路の道の遠ければ羽をやすめんと米島の松), about „The wild geese flew a long distance along the Koshiji (an old name of the northern Hokurikudô) but is now able to rest its wings at the pines of Yonejima“. Well, Masashige actually recited the poem from the „Nijûichidai-shû“ (二十一代集) anthology wrong but that doesn´t matter here. Important for the understanding of the kinzôgan-mei is that he compared himself with a bird, a wild geese, finally arriving at Yonejima, a flowery description of a peaceful place with enough food and drink. In short, Yonejima refers to his then and again „employer“, the rich Kaga fief. So by seeing this screen Masashige, then 60 years old, recapitulated his own eventful life so far and realized that now he had found his final place to stay at the Maeda which accepted him once more as retainer. So Oura sees the nickname „moulting hut“ of the blade in the context of this comparison of Masashige himself with a wild geese and his then stage of life. I.e. he regarded the Kaga fief as safe place to moult. By the way, he was 32 years old when he was hired by the Maeda the second time. So we have here just a three-character nickname inlayed on a small but fine wakizashi but which unfolds a comprehensive insight into the entire life of the blade´s owner. This is very fascinating and shows us how profound kinzôgan-mei can be. Superb write-up! I really enjoyed reading this one and learning from it!